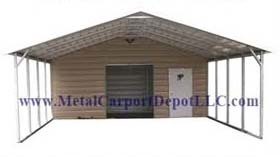 Conveniently Shop On Our Website For Free Standing Metal Carports, Fully Enclosed Metal Buildings, Metal RV Covers, & Metal Carport/Storage Combo Units. 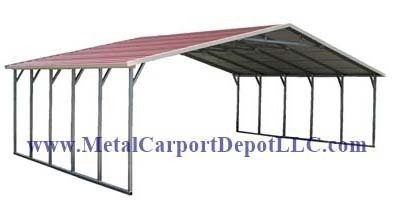 We Offer Low Factory Direct Pricing With Free Delivery & Installation* On A Wide Selection Of High Quality All Steel Structures. From 12' To 24' Wide & From 21' To 41' Long. From 12‘ To 24' Wide & From 21' To 41' Long. From 12‘ To 24' Wide & From 21' To 31' Long. From 26' To 30' Wide & From 21' To 51' Long. From 26' To 30' Wide & From 21' To 31' Long. From 26' To 30' Wide & From 21' To 31‘ Long. From 12‘ To 24' Wide & From 26' To 41' Long. From 12' To 24' Wide & From 26' To 41' Long. 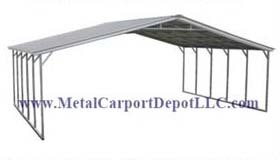 We Sell Certified Metal Carports & Metal Buildings With Free Delivery & Installation In The Following States: AL, AR, AZ, CA, CT, CO, DE, FL, GA, IA, ID, IL, IN, KY, KS, LA, MA, MD, MI, MO, MN, MS, NC, NH, NM, NV, OH, OK, PA, RI, SC, TN, TX, UT, VA, VT, WA, WV, & WI. 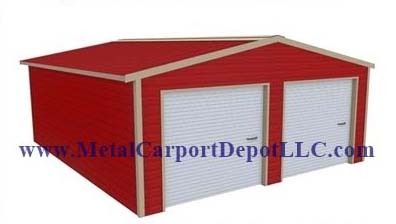 The Regular Style, (Standard Rolled-Corner Type), and the Boxed Eave Style, (or A-Frame Type), both come standard with the Horizontal Roof Design. 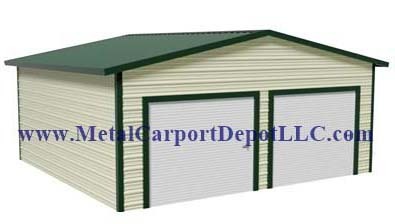 The Boxed Eave Style can also be built with the Vertical Roof Design. Each style can be constructed with either the 14 Gauge or 12 Gauge Frame. 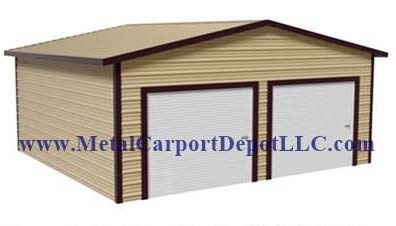 The ridges of the steel panels in a Horizontal Roof design run parallel to the sides of the carport or building. 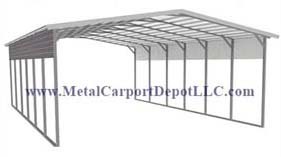 On a Vertical Roof Design, the ridges of the steel panels run from the top of the carport or building to the sides. 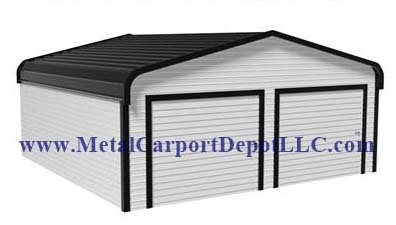 Both Styles and Roof Types can also serve as the metal frame for any Full or Partial Wall Enclosure, or almost any type of custom job you may require. 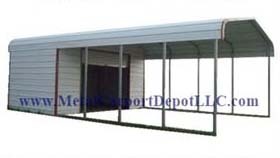 We strongly recommend the Vertical Roof Design on all structures over 31 Ft. long. See our FAQ for reasons why. 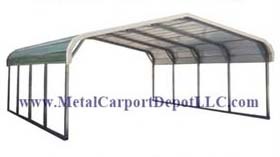 Protect Your Investment For Many Years With A Metal Carport Or Metal Building! 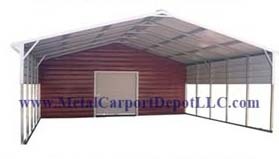 On our website we have priced out many Standard Size Metal Carports, Fully Enclosed Metal Buildings, Carport & Storage Combo Units, & Triple Wide Metal Carports to save you time and money. We can also accommodate your needs with any custom size, including specific widths & lengths. 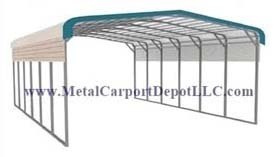 Our Metal Carports Can Be Ordered Here Online Or By Phone. Call Us Monday To Friday 8:30 AM To 7:00 PM & On Saturday From 9:00 AM To 3:00 PM Central Time For A Free Quote, Answers To Your Questions, Or Assistance With Your Order. 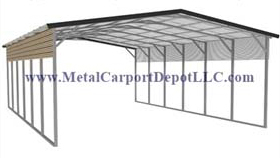 We Can Also Build Clear Span Steel Structures Up To 40 Feet Wide & 100 Feet Long. 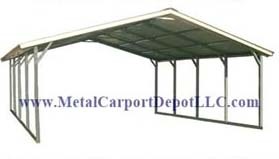 You can select from a variety of options when ordering one of our Metal Carports or Metal Buildings. Additional height is available for the legs & walls, up to 16 feet high. 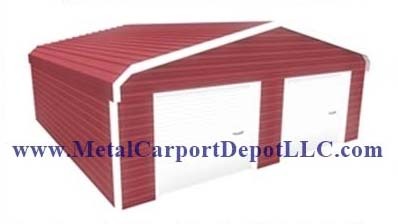 You can purchasing additional panels down the side of your carport or close the ends to keep the blowing rain or snow off of your vehicles or equipment. We also offer helical ground anchors for wind & heavy snow load certification if not anchored to concrete. 12 Gauge frame is also available for higher snow load. We can offer different size roll-up door options, including doors on the side. Add walk-in door and windows too. Some states & cities require building certification. 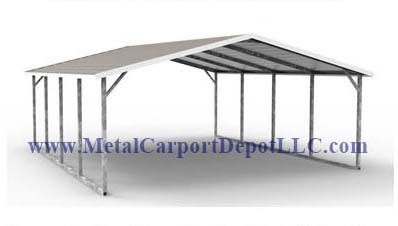 Only Eagle Metal Carports & Metal Buildings are Certified to 140 MPH Wind Speed & 35 PSF Snow Load Standard if properly anchored to a suitable surface. We also offer up to 170 MPH wind speed certification & 65 PSF Snow Load for additional charge if needed. Eagle has a 20 year limited* rust thru warranty on roof, & 90 day workmanship warranty on installation. 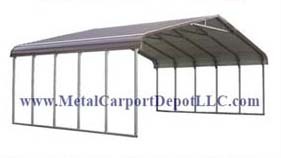 Here You Can Buy The Best Metal Carports & Enclosed Metal Structures Online & Save! *See Product Listing Details For Specific Pricing In Your Area & Areas Served. Certification is based on concrete installation with a proper footing or use of optional ground installation anchors to a suitable surface. Optional braces are required for certification for 9' to 12' legs. Higher snow load & wind rating available at extra cost. Free Delivery, Installation, & Anchoring to your Level Ground, Asphalt, or Concrete Slab. Plus Local Sales Tax Only. 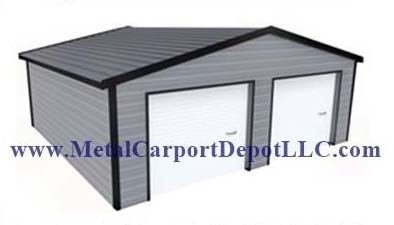 Copyright © 2013 Metal Carport Depot, LLC. All Rights Reserved. Built with Volusion.